Somehow old surfboards comfort me. Looking at them is like looking at a shelf of old books. We have shelves and shelves of books that my mom had as a child and every once in a while I take one down, gently open its pages and inhale deeply. After sneezing, I feel like I do after painting or waxing a yoga block. I am an aesthetic drunk and get wasted with visual and olfactory pleasure. Surfboard wax has the same effect. Oooh perhaps that is what fetishism is? I will have to look into it. I’m new to surfing but not really. I’ve been around surfers my entire life, heard their tales; tall and short. I’ve sat on many a beach watching my brother and friends exhaust themselves in the water and come out like giddy little children. Now I get the benefits of the waters too. I suppose once I catch my first wave I might have to be given a breathalyzer. 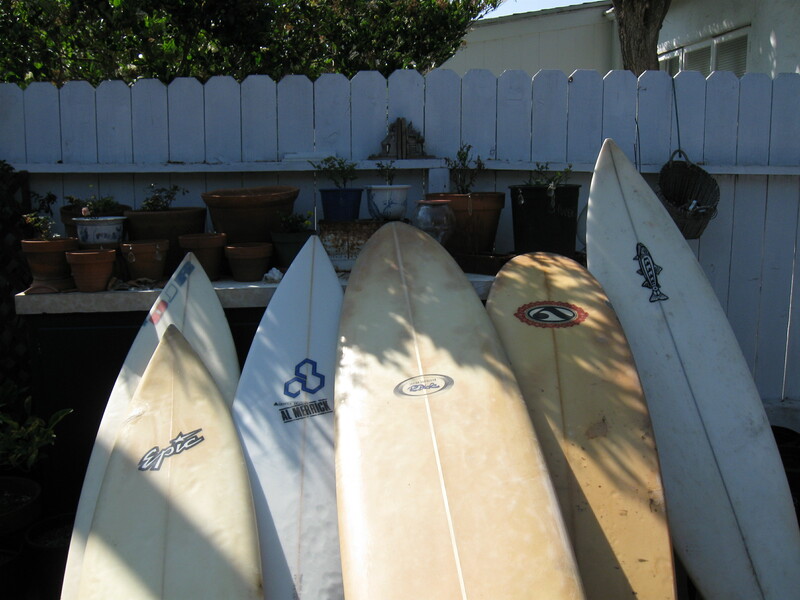 I began collecting old surfboards for a charity called Surfers Healing. Izzy and Daniel Paskowitz began a free day camp for autistic children when they realized the positive effects the ocean had on their autistic son Isaiah. Izzy and his band of wild surfers take the kids, teenagers and some young adults, out on enormous paddle boards and tandem surf with them. It’s quite a sight to behold and again makes me smile so intensely I feel drunk. 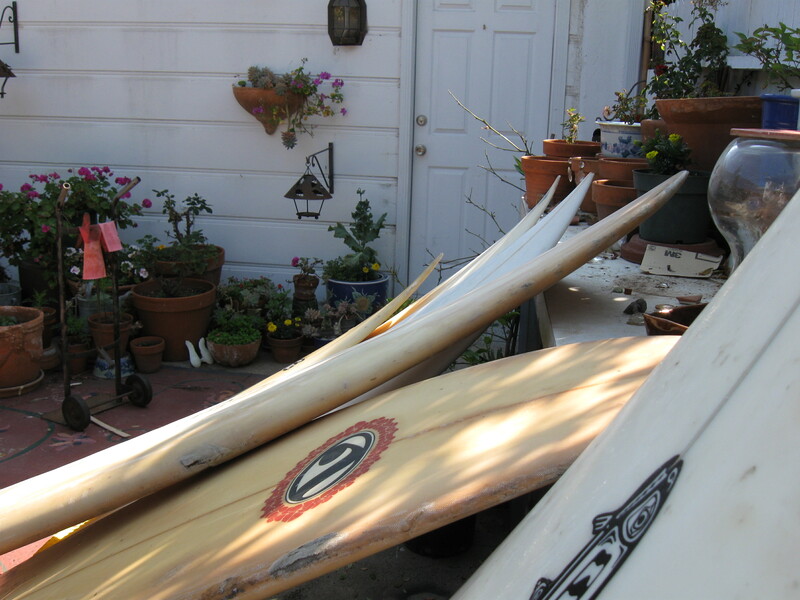 The old surfboards I collected were for the kids to paint while they waited their turn to go into the water. But the boards had to be prepped before they could start painting them or the paint would not adhere. Which meant taking off layers of old wax with turpentine, then lightly sanding them. Working on the boards gave me an appreciation of what an art form board shaping really is. I knew there were different size boards but had no idea how many and how delicate the nuances. I’ve known Lance Carson many years, and just looking at his boards makes me want to cry – they are so beautiful. I still have a few old boards left to work on. They sit patiently waiting for me to attack them. They will never go in the water again but they will not be thrown out either. You would be surprised how hard it is to get an old board out of a surfers hand. Even if it is rotting under a pile of leaves in their garden, it holds sentimental value; and just like a book it holds many stories. I have been here since 1971 and now I can honestly say, I am on the side of the California surfers. DOn’t know of any more satisfying religion. I know those types too and it’s just as well that they never caught the bug. I just met a surfer from South Africa and he had just gotten out of the water. His eyes were bloodshot from sea water, his hair stuck straight up in the air, there was salt on his face and he chatted with me as if we’d known each other for ever. Not all surfers are like this but there is a common language when people love the ocean. Snooty New Yorkers think we are all brain damaged from the sun. Thats fine with me.